After a long time, I ate out with my parents on Sunday. We wanted to go somewhere we hadn't gone before and Zara, on the top floor of the South City Mall, was a convenient choice. Usually, if we go to a new restaurant, we like to try out the buffet. The advantage of that is, you get to sample most all the cooking styles the place has to offer. At Zara, the Sunday lunch buffet was INR 535 before tax and without alcohol. One could opt for buffet with alcohol at a price difference of about 200 rupees. 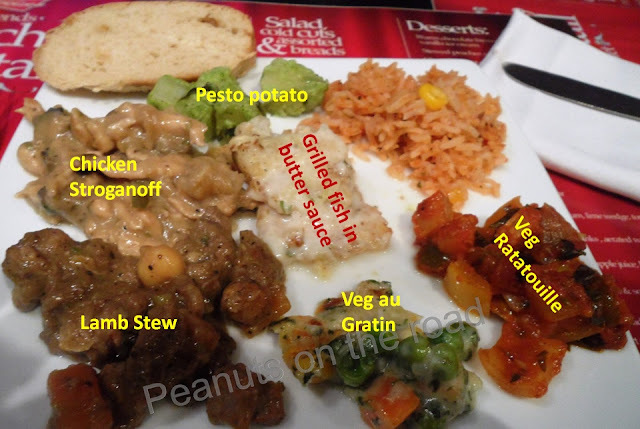 In the buffet, they offer two soups - a vegetarian and a non-vegetarian option, you can have both if you like. We had pea soup and cream of chicken soup. I personally found both quite bland. At this juncture, let me mention that I have lived for a while in Europe during my Masters degree and I know what European food is supposed to taste like. So when I say bland, I don't mean bland by the Indian standard, but by the standard of food I had in Europe. Needless to say, I wasn't impressed with the soup. Then, according to the menu, there was an array of cold cuts and salads. While the salad selection was good, the cold cut section featured only beef. The beef was nice but, when you are in a Tapas bar, you'd expect oil dripping deliciousness of the spanish sausages and salamies on display in the cold cuts section, wouldn't you? The Tapas was served to order. There were eleven kinds on offer and you can order as many times and as many varieties as you like but they make a request that you order one tapas per person at one time. They say this is to discourage wastage and I didn't mind that so much, I felt it was a good idea. However, the time they took between the first and second serving of tapas was terribly long for a buffet setting. Criticism aside, the tapas was quite nice. We took the breaded mushroom, crispy babycorn, spicy chicken sausage, chicken and cheese quesadilla, cajun spiced fish fingers and beef tenderloin with mashed potatoes. The mushroom and the babycorn dishes were quite nice, the sausage good and the tenderloin absolutely delicious. The main course was where Zara lost its identity. The chicken stroganoff and the lamb stew were excellent, but the fish in butter salt was very salty and the pesto potato forgettable. The vegetable ratatouille and au gratin were decent. There was also a pasta station which made decent pasta to order and an omlette station. Despite having a rather wide array of options, it was here that Zara sort of missed its mark. When you market yourself as a Tapas bar and restaurant, one would expect more Spanish influences in the main course. Instead it was a hot continental mess. I am not saying that the food was bad, I am just saying that the buffet was confused, it felt like not a lot of thought has been put into it. My parents argued that the pasta station was included for common popularity. May be so, but in Kolkata, where there is still a sad lack of specialty restaurants, it would have been nice if for once a restaurant did what it claimed - in this case, serve Spanish food and do it well. The desert selection was small but nice. We had the stewed peach in orange sauce, the chocolate mousse with coffee cream and vanilla ice-cream with chocolate and nougat. The chocolate mousse was the best I have had in a long time. If you are a dark chocolate lover, try it. Overall, there was a lot of things to be desired from a Tapas bar. Granted we opted for the buffet option but still, chorizo sausages and squids and scallops were conspicuous in their absence. I would suggest you to try Zara for the Tapas alone. Go for à la carte and skip the buffet if you want an authentic feel of Spanish food. However, if you can forget the promise of a Tapas bar, the buffet would provide a nice change from the regular Chinese buffet available everywhere.